Fur on ocelots’ necks grows in parallel stripes slanting forward, the opposite direction of body fur. Throughout much of its range, the ocelot tends to be the most abundant cat species. 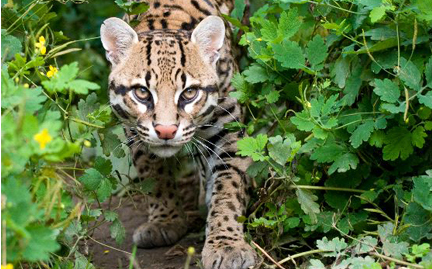 Ocelots live in a wide variety of habitats ranging from marshes to savanna grasslands to tropical forests. Mostly nocturnal, they spend their days in trees or thick vegetation. Strong swimmers and agile climbers, ocelots are usually solitary and territorial cats.